In a change aimed at increasing the relevance of its suggested videos and discouraging misleading thumbnail practices, YouTube announced that it has changed its video recommendation algorithm. Now, total viewing time will be factored into the suggested video algorithm, meaning videos with spammy, irrelevant content or deceptive thumbnails will not rank as well as more focused and rewarding clips. It’s important to note that rather than determining the video’s viewer retention as a percentage of video watched, the algorithm instead accounts for the total number of seconds someone watches a video, regardless of overall length. Here’s three ways to increase your viewing time and keep your viewers hovering at the edge of their seats instead of hovering over the back button. Although total viewing time is the new change that will affect the recommended selections, clicks will still be incorporated into the overall algorithms suggestions. To that end, it’s still very important to make an expressive thumbnail to draw in potential viewers. Think of your thumbnail like a movie trailer – it should capture enough of the video’s essence to let viewers know what it’s about without giving away the ending. It also should be reflective of the title of the video – don’t forget that these will come up in search results, so don’t rely on your channel or personal brand to provide the entire context. Just like a movie series, it should also incorporate some standardized branding visuals as well, providing a link in the viewer’s mind between videos. YouTube is adding additional tools to help manage videos and monitor their progress. In addition to their tools for tracking viewership and traffic sources, YouTube has debuted their downloadable Watch Time report, accessed in the top banner of the Analytics Views Report, with helpful metrics like Total Watch Time for videos as well as standard demographic and referral data. Use these metrics to help shape the content and timing of your videos. 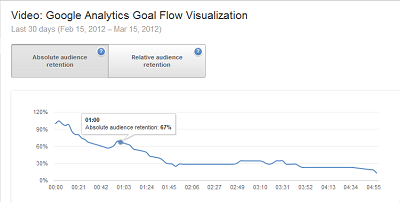 Additionally, the Audience Retention tool provides a visual way to break down where your videos are losing or gaining traffic. Most viewership peters out towards the end of the video, dropping sharply when the outro includes company or personal branding. Content-hungry users will skip onto another video, losing you extra seconds of viewership that can factor into your videos relevant ranking. A simple way to diffuse this is to move all branding and ‘credits’ towards the beginning of the video. Be careful to include an introduction before your credits to ensure the viewer doesn’t simply skip past them in the beginning as well. This simple shift will earn you extra viewing time and ensure that your brand is getting exposure to the viewer. Interested in easily tracking embedded YouTube videos on your website? Do you think the changes to the Suggested Videos algorithm will be helpful or hurtful? Sound off in the comments and let us know what you think.